The unique feature of the free StarWind V2V Converter is that it allows IT administrators to easily migrate any virtual machines from direct attached storage to shared storage on the network in one quick and simple step. Therefore, anyone can move VMDK or VHD images safely to shared storage. This allows virtual server clustering and ensures high application and VM availability. This also means that system administrators will be able to use advanced VMware features such as VMotion, VMware HA, DRS and VCB now that they moved VMDKs to shared storage. 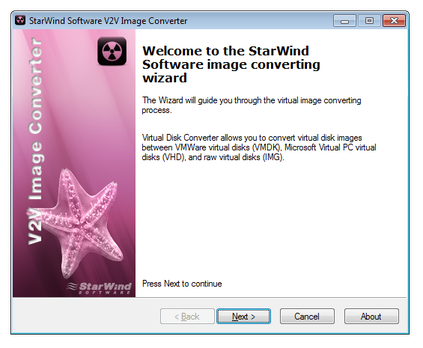 If you need more information please contact the developers of StarWind V2V Converter (StarWind Software Inc.), or check out their product website.